Fresh equity investment of €1 million will see Galway’s Syncrophi Systems bring to market a portable patient monitoring system for hospitals. Syncrophi’s KEWS100 uses a lightweight wireless module that allows medical staff to monitor patients’ vital signs while they move around the hospital. The system can be connected to nurses’ stations, so that clinicians can remotely monitor patient trends in heart rate, temperature, blood pressure, respiration and oxygen saturation. The KEWS100 is being installed at the Galway Clinic with further installations planned for medical facilities in Ireland and Britain. “This seed capital round has enabled us to bring KEWS100 to market at an opportune time,” said Syncrophi’s chief executive David Toohey. “We have received tremendously positive feedback from frontline customers and significant interest from potential distribution partners in Ireland and overseas. Syncrophi’s investment round includes funding from the AIB Seed Capital Fund, co-managed by Enterprise Equity Venture Capital, and the Western Investment Fund, managed by the Western Development Commission. 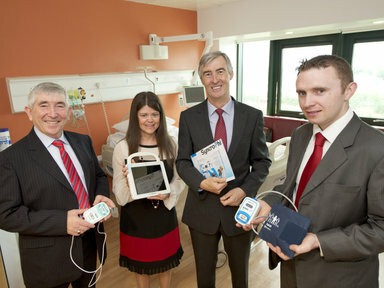 “We see Syncrophi’s novel technology as a game-changer for hospitals and other healthcare facilities, in so far as it provides them with an easily-installed and cost-effective means to monitor the vital signs of patients on a continuous basis without confining them to bed,” said Rory Hynes, partner, Enterprise Equity, co-manager of the AIB Seed Capital Fund.